And the fashion was worth remembering as well. Closing the award show season with shimmering excitement and romantic, pale hued grace, the fashions of this year’s Oscars red carpet were absolutely stunning. And the actresses who wore them looked like perfection. With a wonderful, breathtaking combination of metallic dazzlements and light, romantic accents, the looks on yesterday’s red carpet left people with feelings of both bright vivacity and glowing charm; the looks on yesterday’s red carpet allowed people to live in both zesty, flavorful worlds and whimsical, chimerical universes. Whether it was Nicole Kidman’s sparkling L’Wren Scott gown or Zoe Saldana’s lilac Alexis Mabille Couture creation, that fashions at the Oscars were magical. Amy Adams looked like a true princess in her strapless Oscar de la Renta ball gown. The look was entirely enchanting, with complementing, beautiful powder-blue shades and cascading, seemingly airless ruffles that tapered out effortlessly behind her. The bodice on the top added to the overall sophistication and delicacy of the look. Adams glided on the red carpet with experienced poise and frilly wonder. With dazzling diamonds, Adams radiated in both her majestic, consuming glory and delicate, refined elegance. A bold, unwavering woman walked down the red carpet this past Sunday, embracing the power of couture and radiating in minimalistic design. And her name is Charlize Theron. This sleek, modernized, white Dior Haute Couture gown looked incredible. With its tight fit and glistening accentuated peplum waist, the gown shined in its confidence and refined, seductive edge. The structured tailoring and flowing train only added to the gown’s glory. Charlize Theron looked brilliant in her sharp, contemporary masterpiece, especially with her fierce, outspoken pixie cut. Jennifer Lawrence is a true gem in Hollywood who, I believe, deserved the Oscar for Best Actress tremendously. Her natural talent is undeniable. Her genuine personality is unmistakable. And both of these qualities gleamed in their beauty on the red carpet this past Sunday. Jennifer Lawrence looked stunning in this blush, pale pink Dior Haute Couture gown. The grand, voluminous design looked extraordinary with its timeless bell-shape and flowing, rich train. The gown was full of luxury, enveloping superb, shining fabrics and details of light, sweeping textures. Finishing the look with a lovely diamond necklace trickling down her back, Jennifer Lawrence looked like a winner. They are worthy of their own Oscars! 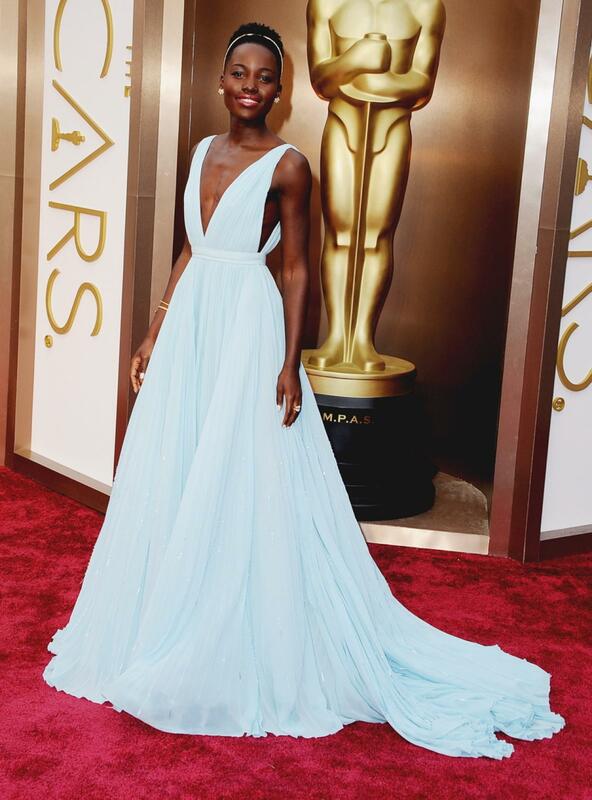 And the final Oscar for best outfit goes to… Viola Davis! My one word to describe this outfit: radiant! Au natural is the way to go! Another amazing actress and another amazing designer! This Vera Wang custom gown was both long and flowing. With its emerald color and mermaid-style shape, this strapless, cleavage-bearing gown was absolutely stunning! Viola Davis truly stood out in this shining creation with its sparkling embroidered neckline and pleated detailing fanning out from the knee. This dress hugs Davis’s curves in all the right places and makes her truly glow! Besides the stunning gown, what I love most about Davis and this outfit all together is her decision to keep her hair natural. She finally decided to ditch the wig and be herself! I thought this decision was both bold and mesmerizing! Not being afraid to be yourself, isn’t that what fashion is all about? Davis was a real jewel this past Sunday and made the Oscars red carpet sparkle! On a side note…Make sure to check back this weekend as I talk about one of the hot trends this upcoming spring that particularly caught my eye! Wow Michelle Williams, Your Week with Marilyn certainly paid off! My one word to describe this outfit: classic! Cute and coral! Marilyn..ahem.. I mean Michelle looked flawless! I applaud to the creative director of Louis Vuitton, Marc Jacobs, not only because this dress was beautiful, but also because he picked the perfect person to wear it! Williams looked forever adorable with her short blonde pixie cut and bright coral and plum colored lips. This ruffled, coral colored dress was absolutely precious! With a peplum waist and a small bow at the hip, this dress showed elegance at its finest. Lovely, brilliant, and classic, this outfit was immaculate! With a simple diamond necklace to top it off, I almost felt as if I was seeing the real Marilyn Monroe come back to life! Love, love, and love! Jessica Chastain, you definitely did not need any Help with this masterpiece! My one word to describe this outfit: breathtaking! Intricacy, regality, and artistry all mixed into one exquisite outfit! This Alexander McQueen creation was by far one of the most daring, risky dresses that was worn on the red carpet this Oscar Sunday. Not only was it unexpected and completely original, it was also on trend! The colors gold and black are very big this upcoming spring and McQueen sure did not disappoint! With its rusty gold, butterfly effect embroidery and remarkable texture, this dress was by far one of my favorites. It manifested a theatrical and regal air as Chastain walked gracefully on the red carpet. Jessica Chastain looked both imperial and radiant. Although Chastain did not win the Oscar for best supporting actress, she was a fashion winner in my book! 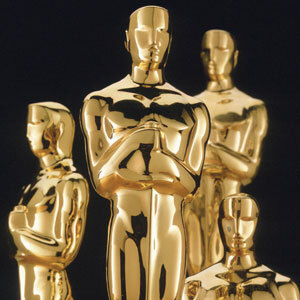 Ah, the Oscars, a time when Hollywood’s leading actors and actresses come together to celebrate the film industry. It is a time when a variety of designers unite together with one set goal in mind; the desire to create something unique and memorable. As the red carpet rolled out and the limos pulled up the street, the Oscars had truly begun! Overall, I was pretty pleased with the fashion I saw this year. There were no big mishaps, no horrible, tacky dresses that exuded terror rather than beauty. Instead, there were beautiful creations that defined structure and grace. The designs were subtle, and most importantly elegant. There was an undeniable radiance as the actresses graced the red carpet with their all too perfect white smiles. From one-shoulder drapery to conservative long sleeves, fashion took many unique forms. Dresses of gold, white, and red encompassed actresses silhouettes as jewels of exorbitant prices graced their necks, ears, and wrists. I almost felt as if I were in Old Hollywood, with the glam of past actresses such as Elizabeth Taylor coming to life. I decided to pick out my three top red-carpet outfits that I felt were the most stunning and noteworthy. Over the next week I will profile my three favorite outfits. Make sure to check back!